Every cat owner knows that no two cats are alike. This pitch-perfect illustrated book proves this simple fact by diving whiskers first into the unique personality, charisma, and character of 50 real all-black cats. From Alfie, who "has no tolerance for wet humans or being ignored," to Sashi, who "enjoys freeze-dried chicken by candlelight and full-on body rubs," each cat comes to life through a lovingly hand-drawn portrait and quick-witted profile. Delightfully quirky and utterly charming, this motley crew of black cats will win over anyone with a dry sense of humor. Amy Goldwasser is an editor and writer, originally from Detroit. Peter Arkle is an illustrator and Scottish. They share a home, an office (Studio Goldsparkle) and two cats (Mimi = All Black Cat; May = other) in New York. Their clients, independently and in collaboration, include magazines, books, websites, newspapers, apps, fashion labels, tech startups, restaurants, running shoes, a scientific research lab, hotels, museums, hair products (styling and loss), schools, whiskies, skyscrapers and other enterprises that keep life interesting.
" features 50 hand-drawn portraits of unique and charming black cats paired with lovely stories." "This book...is the pick of the litter"
"So fun and sweet. Cats!" --Paul Feig, creator of Freaks and Geeks, director of Bridesmaids, Spy, The Heat and Ghostbusters (2016). "Black cats are notoriously hard to photograph - they tend to show up in pictures as dark blobs with demonic glowing eyes, which, when combined with the whole 'unlucky' superstition, has led to a black cat majority in shelters around the world. 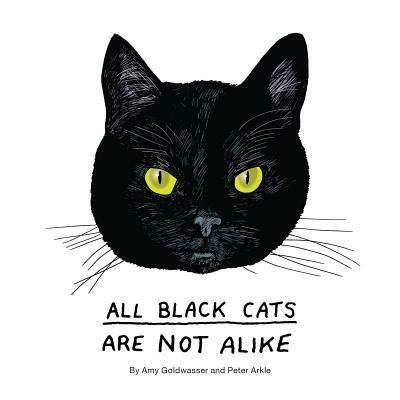 And they're even harder to draw, which makes a new book, All Black Cats Are Not Alike, by writer-illustrator duo Amy Goldwasser and Peter Arkle, a true feat in the age-old tradition of cat art." "As the weather turns cooler, you might want to cuddle up with a good book this month. We suggest All Black Cats Are Not Alike, which features profiles of 50 different black cats and what makes them unique." "A hilarious illustrated personality profile of 50 real cats." "This collection of true stories and hand-drawn illustrations fights the unlucky stereotype that all black cats look and act the same." "Yes, your cat is very special"
"This new book by Amy Goldwasser and Peter Arkle is filled with true-life tales and stunning hand-drawn portraits of 50 entirely unique all black cat characters. This limited-edition hardcover is a loving tribute to feline eccentricity and charm-and the purrrfect (sorry!) gift for the cat lover in your life."